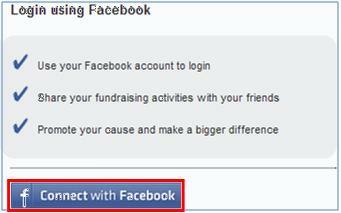 Can I use my Facebook account to sign up or log in to GoFundraise? YES! Here at GoFundraise, we’re proud of integrating social networking into our platform. Here’s the beginning of how to utilise what we have to offer in this regards. This is for people who don’t have an account with GoFundraise yet. Click ‘Sign Up’, found in the top, right-hand corner. Scroll down and click ‘Connect with Facebook’. Enter your the email address and password you use for your Facebook account. It does not have to be the same as the address you plan on using for your GoFundraise account. Click ‘Allow’ if you’re happy with the options selected on the pop up box that will appear. To sign up with GoFundraise, click ‘No, It’s my first time’ when you are redirected to the GoFundraise website, and follow the prompts. This is for people who already have an account with GoFundraise. Click ‘Log in’, found in the top, right-hand corner. Click ‘Connect with Facebook’, on the right-hand side of the page. Enter you’re the email address and password you use for your Facebook account. It does not have to be the same as the address you plan on using for your GoFundraise account. 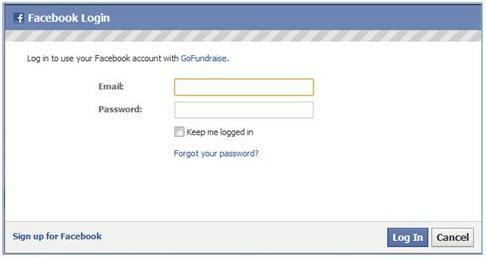 To log in, click ‘Yes’ when you are redirected to the GoFundraise website, and sign into your GoFundraise account. Your GoFundraise account is now connected with Facebook.